According to Abraham Pflüger’s death and burial record at Zion Lutheran Schumm, Abraham was born 5 March 1852 in Willshire Township, Van Wert County. He died 5 June 1936 in Fort Wayne, Indiana, at the age of 84 years and 3 months and was buried in Zion’s cemetery on 8 June. Abraham was most likely the son of Michael and Catherine (Brandt) Pflüger. 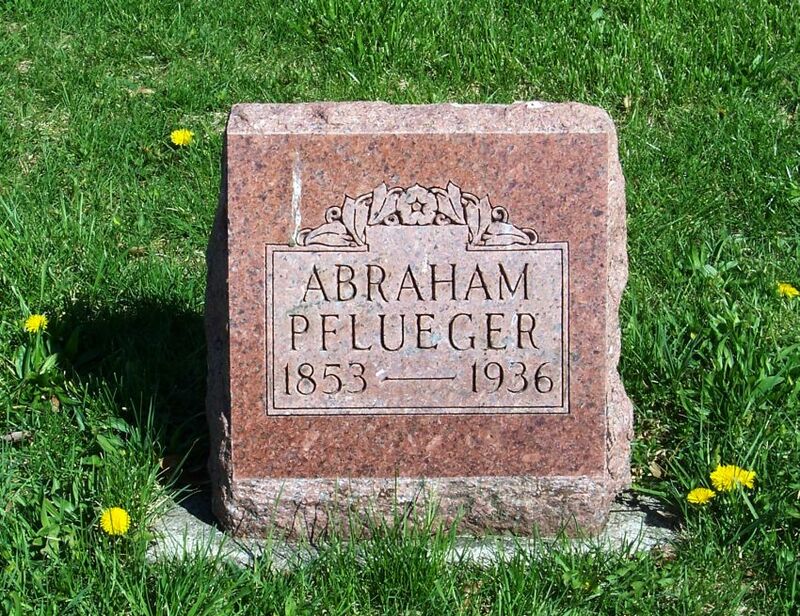 He was enumerated with the Michael Pflüger family in 1860  and 1870 , but neither of those census enumerations give the relationships of family members. And unfortunately there were not many Pflüger entries in Zion’s church records. 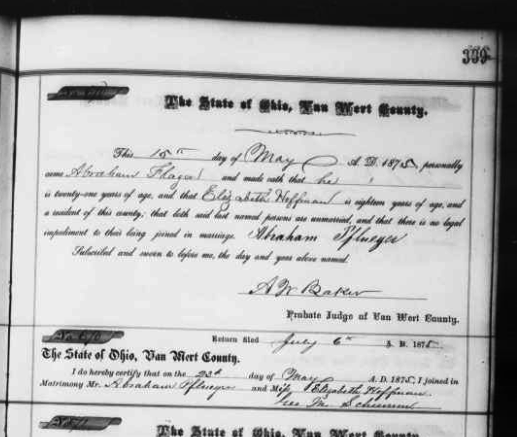 Abraham Pflueger & Elizabeth Hoffman marriage, 1875, Van Wert County, Ohio, Vol. 4:339. Abraham was a carpenter by trade and built and repaired many barns in the Schumm/Willshire area. In fact he built a two-story granary for my great-grandfather Lewis Schumm’s farm. We know this because he carved Granary built in 1901 by Abraham Pflueger on one of its walls. 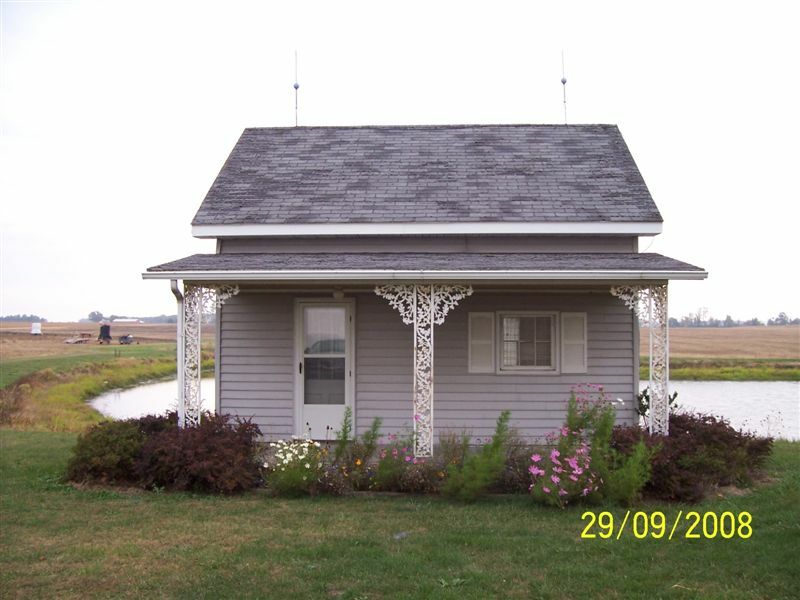 The granary was converted into a cottage several years ago by my mom and dad and was moved near the farm pond, north of its former location. Granary build by Abraham Pflueger in 1901, now a cabin. 1860 U.S. census, Van Wert County, Ohio, p. 425, dwelling 1066, family 1060, Michael Pfluger; digital image by subscription, Ancestry.com (http://www.ancestry.comn : accessed 18 February 2013); FHL film 805045 from NARA microfilm M653, roll 1045. 1870 U.S. census, Van Wert County, Ohio, p.445A, dwelling 216, family 217, Michael Pfluger; digital image by subscription, Ancestry.com (http://www.ancestry.comn : accessed 18 February 2013); FHL film 552774 from NARA microfilm M593, roll 1275. 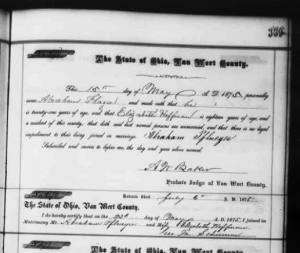 “Ohio, County Marriages, 1789-1994,” index and images, FamilySearch (https://familysearch.org/pal:/MM9.1.1/XD24-TL3 : accessed 18 Feb 2013), Abraham Pflueger and Elizabeth Hoffman, 1875; Vol. 4: 339, FHL microfilm 1015860. 1880 U.S. census, Allen County, Indiana, ED 112, p. 379B, dwelling 161, family 161, Abraham Pluegar; digital image by subscription, Ancestry.com (http://www.ancestry.comn : accessed 18 February 2013); FHL film 1254264 from NARA microfilm T9, roll 264.